A DIY oatmeal bar is a fun way to make breakfast for the whole family or to put together an impressive but easy weekend brunch party. It may seem like preparing only one entrée isn’t enough, but as long as your toppings bar has good variety, you can easily provide something for everyone without having to wake up before the sun to prepare. In fact, most of these options can be store-bought or prepared the night before. Old-fashioned and steel cut oatmeal start from the same oat grout, but they’re processed differently. Because steel cut oats have the least processing, they have fewer calories, more fiber, and no sugar. The more oats are processed, the more calories and sugar they have, but the faster they cook. If using old-fashioned oats, place three cups of oats into your pressure cooker. Add 5½ cups (1.3 L) water and ½ tsp (2 mL) salt. Select the CUSTOM setting for 5 minutes. 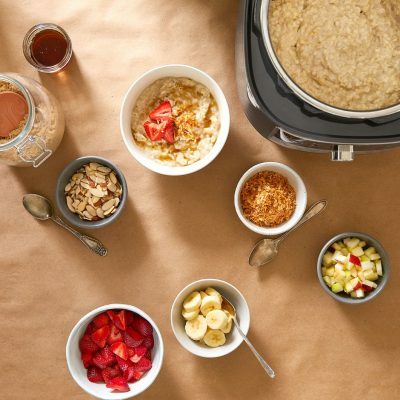 If using steel cut oats, place three cups of oats into your pressure cooker. Add 7 cups (1.6 L) water and ½ tsp (2 mL) salt. Select the WHOLE GRAINS setting for 12 minutes. Regardless of which types of oats you use, you’ll want to coat the inner pot of the pressure cooker with canola oil to prevent sticking. If using steel cut oats, it’s best to add 1 tsp (15 mL) of canola oil to the inner pot along with the other ingredients. This helps prevent the oatmeal from foaming, which can sprinkle from the steam-release valve when you release the pressure. Fresh fruit is the ideal oatmeal topping if you or your guests are looking for an Instagram-worthy breakfast. Whole berries like raspberries and blueberries are great additions that just need a quick rinse before being put out. Fruits like bananas, strawberries, and apples are also favorites for oatmeal, but they’ll need to be pre-sliced before serving. Using dried fruits like cranberries, raisins, and apricots in your bar is another way to add variety with minimal effort. You can buy nuts like almonds and walnuts already chopped, but bags of whole nuts are usually cheaper if you don’t mind chopping them yourself. Toasting nuts is a great way to bring out their flavor and reduce any bitterness. If you want to take that extra step, make sure to roast the nuts before you chop them. You can also include seeds, like chia and flax, if you or your guests are interested in a boost of antioxidants and fiber. Some of the best oatmeal toppings are those that have been used for years: Brown sugar, maple syrup, honey, and cinnamon. But you can also go outside of traditional oatmeal sweeteners and include agave syrup, cocoa powder, applesauce, and your favorite jam or preserves. If kids will be using your oatmeal bar, consider giving them a fun way to drizzle the sweet toppings onto their oats. Who says oatmeal has to be sweet? There are lots of great, savory toppings for oatmeal that your guests might love. When creating your topping bar, put out bowls of cooked, chopped bacon, sliced avocado, and freshly grated Parmesan and cheddar. Don’t overlook bottles of hot sauce and olive oil, and if you feel ambitious, you can add bowls of chopped green or caramelized onions. Did we miss anything? Add your favorite oatmeal toppings below! I love to use the Pampered Chef French Toast Popcorn Seasoning on my oatmeal everyday! Can anyone suggest how I would double the oatmeal recipe. 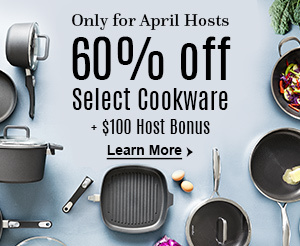 If I double the water and oatmeal, do I double the cook time too?